Raw peeled king prawns (Litopenaeus vannamei), defrosted. Plump, juicy and skilfully prepared ready for cooking. Our prawns have been carefully selected from the warm waters of farms that follow our strict welfare standards. Prepared and ready to cook. 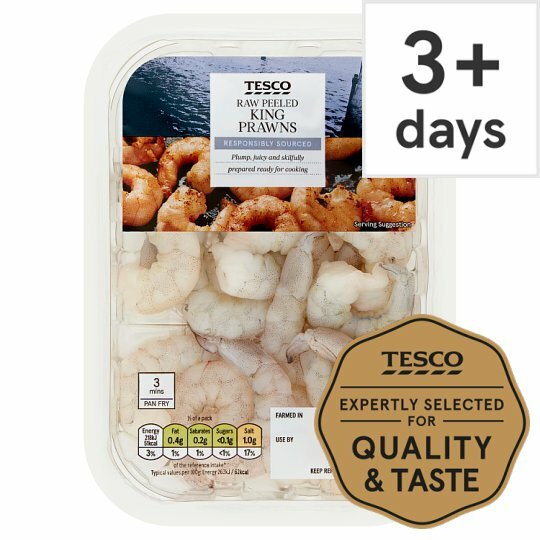 Responsibly sourcing our seafood is important to us, which is why Tesco fish experts work with responsibly managed farms and fisheries to continually improve their high standards of quality, welfare and sustainability. Keep refrigerated. Once opened, use immediately., This product has been previously frozen and has been restored to chill temperatures under carefully controlled conditions. Defrosted: It is still suitable for home freezing. Instructions: Remove all packaging Pan fry in a little oil over a high heat for 2 - 3 minutes, turning frequently.